QRZ.com provides a forum whereby you can register for free (using your ham call sign, plus a password) and be able to participate in discussion groups on various topics, or post questions to ask other hams. QRZ.com also has links to a multitude of information, ranging from software, to radio mods, to vendor links. QRZ.com has on-line testing for the various classes of ham licenses as a free service as well. Most of the hams who have been around for awhile, know about the free service offered by QRZ.com were you can perform a callsign database search by callsign or name. Or for that matter, by city, county, state, well, you get the idea. But if the number of valid searches is greater than 500, they only display the first 500 records found. What some hams apparently aren't aware of however, is that you can log in on QRZ.com and update or provide your own Biography and Photograph. See this web link for an example of how the webmaster for SanAntonioHams.org has updated his. Each ham can control unlimited numbers of other call signs, but if they catch you abusing this, such as purposely altering another ham's records improperly, you will be banned from QRZ.com. Once someone registers as control of another call sign, nobody else may alter it. An example might be if you were trustee for a club call and needed to keep it updated. Another would be if a friend become a silent key (deceased ham) and their bio needed changed to provide details. All photos are examined manually prior to posting, and photos in bad taste will never appear. Read their guidelines before posting. You can also provide your email address for contact info, and they create an image with your address in it, not a clickable email link. This is to reduce harvesting of email addresses by SPAMMERS. Confused about some phrase or term you heard on the air or at a club meeting? Let us help you get rid of your confusion. 807 An old glass vacuum tube, several inches tall and around. Also, slang for a beer, as in "there's nothing like a cold 807 on a hot Arizona afternoon" (thanks to W7QY). According to our friends in Ireland, a pint of Guinness is known as a "Black 807" (thanks to GI4FUE). A-Index Linear index for measuring the disturbance level in the earth's magnetic field. The index is defined over a period of one day (Courtesy of IPS Radio and Space Services, Sydney, Australia). AM "Amplitude Modulation"; slang often used is "Ancient Modulation" (courtesy of VE3FFK). Antenna Party A long-standing tradition among hams where several gather to assist a fellow ham in mounting antennas and/or towers. Often accompanied by malt consumables and lies AFTER the tower and the antennas are up and working...well, the consumables anyway (thanks to WD5CTQ). AOS "Acquisition of Signal" from a satellite; occurs when the satellite becomes "visible" to the antenna as it comes up from the horizon. ARRL "American Radio Relay League"; A U.S.-based organization which exists to support Amateur Radio. For more information, please visit http://www.arrl.org. ATV "Amateur Television"; typically found on the 430 MHz and 1.2 GHz bands; see http://www.hampubs.com/atv.htm for more information (thanks to KG4LXA for the suggested link). AWG "American Wire Gauge"; a system of describing the diameter of wire by which the wire size increases as the gauge number decreases. Barefoot Refers to running your transmitter without an amplifier (in other words, the "power out" is being produced entirely by the transmitter, without any assistance from an amplifier). Bird 1. nickname for "satellite", in the case of Amateur Radio, examples include RS-12/13 (Radio Sputnik) and AO-40 (AMSAT-OSCAR). See http://www.amsat.org/amsat/sats/n7hpr/satsum.html and http://www.hampubs.com/satellite . 2. brand name of a high-end, high quality directional wattmeter. Birdie A signal produced within a radio, typically by it's microprocessor or related circuitry, that appears at specific intervals across the tuning dial of a receiver. Usually it is a product of mixed intermediate frequencies within the radio. Considered bad form. Boat Anchor Slang for a large, heavy, usually old radio, typically restored (courtesy of VE3FFK). BPSK "Binary Phase Shift Keying"; a modulation technique used in LowFER and MedFER operation, as well as HF operation. For more information, see http://www.computerpro.com/~lyle/watsbpsk.htm (courtesy of KØLR). Bug A mechanical keying device for transmitting Morse Code semi-automatically. CC&R's "Covenents, Conditions, and Restrictions"; an extensive set of rules drawn up by homeowner's associations and their lawyers which, among other things, typically restrict or completely prohibit a homeowner from having most forms of antennas on his/her property. Such regulations are formed and placed upon the property before the home is initially sold, and typically remains in effect for the life of the home. 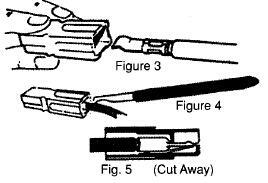 Coax Coaxial cable; RF transmission line; used to connect an antenna to a radio; "coaxial" indicates that the conductors are about the same axis, with a center conductor being on that axis, and the "shield" wrapped around the axis (dielectric separates the center conductor and the shield wires). CTCSS "Continuous Tone-Coded Squelch System", also known as "PL" ("Private Line", trademarked term by Motorola), "Call Guard" (trademarked by GE), or "subaudible tone". A means of transmitting a tone along with your signal. This tone tells a receiver to open up its squelch so that the signal is received. This method is commonly used with repeaters. CW "Continuous Wave"; popular digital mode on HF which utilizes Morse Code; regarded by many as the *first* digital mode. Deviation The resultant frequency swing of a signal that is frequency modulated (FM). Dielectric A non-conductive material used to separate the center conductor and shield (conductor) in coaxial cable; typically made of foam or plastic. Dipole Likely the most common wire antenna amongst hams, the easy-to-homebrew dipole consists of two legs (each 1/4 wavelength) which typically extend horizontally and away from each other. One leg connects to the coax's center conductor, and the other leg connects to the coax's shield as a counterpoise. The dipole antenna is usually strung in a horizontal fashion between trees, and works best when at least 1/4 wavelength above the earth. DR A CW abbreviation for "dear", used as a respectful salutation. Example "GOOD EVENING, DR JOHN, HW ARE U?" Driven Element An "arm" of a yagi antenna to which RF power is fed from the coax. DSW Russian abbreviation for "goodbye" on CW. DTMF "Dual Tone, Multiple Frequency"; a tone that is actually comprised of two different tones sounded at the same time. It is what you hear when you use the pushbuttons on a standard non-pulse telephone in the U.S. It is also a common way to send analog numeric information, since each numeral between Ø and 9 has its own separate tone (and also # and *, and in the case of some radios, A, B, C, and D). Dummy Load Typically a power dissipating resistor or device substituted in place of an antenna on a transmitter, used for testing purposes. DX Long distance; making contacts over long distances. For HF contacts, "DX" is typically considered as such if the station contacted is outside of your country. In some other cases, making a contact over what is considered extremely long distances (for the conditions and band) can be considered "DX" (i.e., a QSO from one end of a state to another, on 2 meters simplex, can be considered "'DX"). DXCC "DX Century Club". An ARRL-sponsored club by which membership is allowed only after showing proof of having made contact with at least 100 different countries. For more information, please see http://www.arrl.org. DXpedition Derived from the words "DX" and "expedition", this term typically refers to a trip made by experienced ham operator(s) to a "DX" country for the purpose of providing other hams an opportunity to make a contact (QSO) into that country. ERP "Effective Radiated Power"; the power supplied to an antenna multiplied by the antenna gain in a given direction (if the direction is not specified, the direction of maximum gain is assumed). Eyeball Face-to-face meeting, as in "eyeball QSO" (to speak to one another in person). FB "Fine Business"; cheerful acknowledgement, or adjective for describing a good quality. Fist The sending style of a particular CW operator. In the old days, telegraphers knew each other by their "fists" (thanks to WD5CTQ). FOC "First Class CW Operators' Club"; an exclusive CW club based out of the United Kingdom. Green Stamp U.S. dollar bill sent along with a QSL card (instead of an IRC) to offset postage costs of a return card. Harmonic 1. Children. 2. Secondary RF emission that is a multiple of the fundamental emission. Homebrew Refers to equipment that is "home built"; something you built yourself. Hz "Hertz"; a unit used to measure frequency. Typically used with "Kilohertz" (KHz) to indicate 1,000 Hertz, or "Megahertz" (MHz) to indicate 1,000,000 Hertz. Iambic A method of Morse Code keying. Holding both paddles at same time sends alternating dits and dahs (courtesy of VE3FFK). Intermod Derived from the expression "Intermodulation Distortion" (IMD). A problem caused in the receiver of a radio by a nearby transmitter's spurious signals which may fall on or very near to the receiver's receive frequency. In some cases, a perfectly clean transmitter (i.e., no spurious signals) can produce intermod if it overloads a receiver or if there is some other point for 3rd order intercept. Intermod which is close, but not necessarily right on, the receiver's frequency can cause the receiver to become less sensitive (also known as "desense"). IOTA "Islands on the Air"; for more information, please see http://www.islandchaser.com/. IQØ Slang for "IQ of zero"; an idiot (courtesy of GI4FUE). IRC "International Reply Coupon". A system by which most country's postal systems provide a coupon which can be purchased, and then used by a sender in any other country to obtain return mail postage. This system allows you to provide return postage for those in another country, especially useful when you do not have access to that country's postage stamps or currency. IRC's are frequently used to assure return postage for a QSL card. For more information, please see QRZ's "QSL Corner" at http://www.qrz.com/qsl.html. J-Pole An antenna design that is relatively easy to assemble yourself. For more information, see http://www2.arrl.org/tis/info/JPole-V.html (Courtesy of ARRL). Note: The basic J-pole design can be applied to any frequency, as long as measurements are proper for that frequency. Furthermore, a 2-meter J-pole will also resonate on the 440 MHz (70 cm) ham band, making for a reasonable dual-band antenna. Kc "Kilocycle"; equivalent to KHz; regarded as an "old fashioned" way of describing frequency. Key Device used by hand to produce Morse Code; can contain either a single, vertically travelling arm (see "Straight Key") or horizontally travelling paddles (see "Paddles") that are used to make ground connection and produce the Morse Code. Keyer Electronic device for sending Morse Code semi-automatically; connects to a key (see above). Dits are sent by pressing one paddle [of the key], dahs sent by pressing the other one (courtesy of VE3FFK). K-Index A three hourly index of geomagnetic activity relative to an assumed quiet day curve for the recording site. K index values range from 0 -very quiet- up to 9 -extremely disturbed- (Courtesy of IPS Radio and Space Services, Sydney, Australia). LID Slang term, often referring to a CW operator with very poor practices and manners. LIon "Lithium-Ion". A type of rechargable battery commonly used with radio equipment. LOS "Loss of Signal" from a satellite; occurs when the satellite becomes "invisible" to the antenna as it goes below the horizon. Lowfer One who experiments with radio communications at unusually low frequencies (typically 1750 Meters, which is 160-190 kHz and can be used under FCC Part 15). For more information, take a look at http://www.altair.org/lowfer.htm (courtesy of N4YWK). Machine Slang for "repeater", and sometimes for rig. Matchbox A device placed between a transmitter and an antenna to tune the circuit to resonance. Normally called an Antenna Tuner (thanks to WD5CTQ). Mc "Megacycle"; equivalent to MHz; regarded as an "old fashioned" way of describing frequency. Medfer One who experiments with radio communications at low frequencies such as those on the edges of the AM broadcast band (under FCC Part 15). MPR "Mass Produced Rig"; a radio which is produced in large quantities; often used to describe radios that are NOT originally purchased in "kit" form. MUF "Maximum Useable Frequency"; that frequency above which expected propagation no longer exists. NiCd Or "Ni-Cad"; "Nickel Cadmium". A type of rechargable battery commonly used with radio equipment. NiMH "Nickel Metal Hydride". A type of rechargable battery commonly used with radio equipment. N-P Junction See "P-N Junction". NTS "National Traffic System". Please see http://www.weca.org/nts.html for more information. OM "Old Man"; affectionate way to address a fellow ham operator, like saying "Old Buddy!" OO "Official Observer"; a volunteer of the ARRL's Official Observer program who monitors the airwaves for FCC rules violations. For more information, please see http://www.arrl.org. Paddles Short for "Morse Code Key", one that contains small paddles that are tapped in order to produce semi-automatic Morse Code (when connected to a "keyer"). Patch Short for "Phone Patch". PEP "Peak Envelope Power"; used to measure power output of an single sideband signal. Phone Patch Device allowing audio from a telephone line to be placed in the audio circuits of a transmitter/receiver (thanks to WD5CTQ). P-N Junction A P-N junction (or N-P junction) is formed by creating two substrate materials of P type and N type on a semiconductor. P type means it is doped with "free holes" (electron depletion) and the N type is doped with electrons. Of course by physics, the free holes and free electrons would like to neutralize each other. A diode is formed with a P-N junction. Basically, when you have a NPN transistor, you have two junctions ... an NP junction between the collector and base, and a PN junction between the base and emitter. Vice-versa with a PNP transistor. How you bias those junctions controls how the transistor works. PL "Private Line", Motorola's trademarked name for CTCSS. PSK31 A digital mode which is rapidly growing in popularity; utilizes phase shift keying (PSK) which is transmitted at 31 baud (speed). For more information, please see http://www.psk31.org. PTT "Push to Talk"; a button on a microphone or on the side of a handheld radio which activates the transmitter. Q "figure of merit" with regard to a tuned circuit (source: ARRL Handbook). With regard to an antenna circuit, the Q has an inversely proportionate relationship to useable bandwidth (with reasonable SWR). For example, an antenna with "high Q" will not provide a good SWR over a very wide range of frequencies. QCWA "Quarter Century Wireless Club", an organization for hams who have held a license for 25 or more years. For more information, see http://www.qcwa.org. Q-Signals Originally developed by CW (Morse Code) operators to make certain, frequently used phrases short and concise -- a sort of Morse Code "shorthand". Common signals include "QST" (announcement), "QSL" (confirmation), and "QTH" (location), and "QRZ" ("who is calling me?"). For more Q-signals, please see http://www.xcvr.com/default.asp?view=qsignals. QSL Bureau Also known as the "buro"; an organization that provides a collecting and distributing point for QSL cards. In large scale situation, typically broken into an "incoming" and "outgoing" bureaus. A good example is the biggest QSL Bureau representing the U.S., the ARRL QSL Bureau. For more information, see ARRL's Incoming Bureau at http://www.arrl.org/qsl/qslin.html and their Outgoing Bureau at http://www.arrl.org/qsl/qslout.html. QSL Card Often referred to as simply a "QSL"; similar in size to a postcard, it is used to "confirm" (or show proof of) having made contact with another station on the air; applies to both "two-way" and "one-way" (SWL) communications; the QSL card is filled out by the issuer/sender, and by convention it contains (1) the station contacted, (2) UTC date and time of contact, (3) frequency/band, (4) signal report (RST), and (5) callsign and address of issuer/sender. QSL cards are commonly used as proof of fulfilling various operating awards such as DXCC, WAS, etc. QSL Manager A person, commonly an Amateur Radio operator, who manages the receiving and sending of QSL cards for a particular Amateur Radio station (the "managed" station). Often, a QSL Manager performs this service because the managed station either has difficulty handling the volume of incoming QSL cards, or the station is geographically located such that it is difficult or impossible for that station to accept and/or send QSL cards. It is very common for "rare" DX stations and DXpeditions to have a QSL Manager. Repeater A system consisting of at least one transmitter, one receiver, and a controller, which receives a signal on one frequency and retransmits it on another frequency. Repeaters are typically located in high locations so that they have greater coverage area. They greatly increase a user's communication range since they can retransmit his/her signal across all of its coverage area. Repeaters are most commonly used on the 2 meter and 70 centimeter bands. See also "Simplex Repeater". RF "Radio Frequency"; typically used as slang for "Radio Frequency Energy". RF Burn A painful sensation felt when coming into direct contact with RF energy; can be dangerous when experienced with high levels of RF power. RIT "Receive Incremental Tuning"; a common feature on HF radios that allows the user to slightly change the receive frequency while leaving the transmit frequency the same. RST "Readability, Strength, Tone"; a system by which a received signal quality is graded, and a signal report is given. "Readability" is judged on a scale from 1 to 5, and "Strength" and "Tone" are judged on a scale from 1 to 9. "Tone" does not apply to a "phone" (voice) signal. A very high quality CW signal is "599" (pronounced "five nine nine"), and such a phone signal is "59" (pronounced "five nine"). Rubber Duck Also known as "Rubber Duckie", a flexible antenna normally found on hand-held tranceivers. Inefficient, but useable, and they don't poke you in the ribs too badly either! (thanks to WD5CTQ). RX Abbreviation for "receiver" or "receive". SASE "Self Addressed, Stamped Envelope"; for more information, please see QRZ's "QSL Corner" at http://www.qrz.com/qsl.html. SFI See "Solar Flux Index"
Simplex Communicating directly from radio to radio (without the use of an intermediary repeater). This term is normally used in the context of environments that frequently use repeaters. Simplex Repeater A radio that has a digital audio store-and-forward relay system. Produces results similar to that of a conventional repeater. Slug A short, cylindrical unit that is inserted into a Bird® Wattmeter (or similar) that allows the unit to read power (watts) for a particular frequency range. A slug always has a finite frequency range and a maximum power rating. By swapping out different slugs, the wattmeter can be used for many different frequencies and power ranges. Solar Flux Index A measurement of radio emission from the sun. HF propagation conditions are considered good when this number is high and the A- and K-index numbers are low. Special Event A radio operating event, usually on HF, in which a group or organization celebrates an event or holiday by making contacts and offering special QSL cards or certificates to confirm the contact. Ham Radio magazines, such as QST, usually publish a monthly list of Special Events. Straight Key A device for sending Morse Code, consisting of a single arm making contact with another point to complete a circuit and key a transmitter (thanks to WD5CTQ). Switching Power Supply A power supply that uses switching transistors (on-off) to increase the efficiency of the power conversion, rather than the simple transformer/rectifier design of traditional power supplies. SWL "Shortwave Listener"; one who enjoys listening to shortwave transmissions, without intention of transmitting. SWR "Standing Wave Ratio"; an indication of how well matched an antenna is to its transmitter. A "one to one" (1:1) SWR indicates a perfect match. Anything less than 1:1 (i.e., 2:1) indicates that the antenna is not perfectly resonant for the transmit frequency, and that some RF power is being reflected back down the transmission line into the transmitter. In general, any SWR which is 3:1 or better is acceptable. Talk-Around Same as "Simplex" (see definition above). Ticket Slang for "FCC License"
TX Abbreviation for "transmitter" or "transmit"
UTC Coordinated Universal Time; a single time reference to be used worldwide (reduces the confusion that can occur when considering multiple time zones). VOX "Voice Operated Relay"; allows the presence of a sound to trigger the PTT. WAC "Worked All Continents"; an award issued to those who make, and have proof of, contact to at least one ham on each continent. Wallpaper Slang for QSL Cards and operating/contest certificates. WAN "Worked All Neighbors"; a station that continually gets complaints about signals showing up on the telephone or televisions at neighbor's houses. Not a desired situation. Polite conversation and changes in operation practices are a common solution. Another is providing simple and often inexpensive filters for the offended neighbor. See the TVI solutions page at the ARRL web site for more information on cures (courtesy of K4GVN). WAS "Worked All States"; an award issued to those who make, and have proof of, contact to at least one ham in each U.S. state. WOLF "Weak-signal Operation on Low Frequency" - for more information, see http://www.computerpro.com/~lyle/wolf/wolf4dummies.htm (courtesy of KØLR). Wouff Hong An instrument of sadistic torture for hams who do not follow generally accepted rules of courtesy on the air. It looks something akin to a Saguaro cactus with one arm missing (courtesy of AA7VP) Note: [the truth] The Wouff Hong sprang from the imagination of ARRL cofounder Hiram Percy Maxim, W1AW, as a means to combat poor operating. WWV A radio station located in Fort Collins, Colorado, that continuously broadcasts standard time of day and other radio and navigation information. For more information, see http://www.lerc.nasa.gov/WWW/MAEL/ag/wwv.htm. WWVH A radio station located in Kauai, Hawaii, that continuously broadcasts standard time of day and other radio and navigation information. For more information, see http://www.chem.hawaii.edu/uham/wwvh.html. 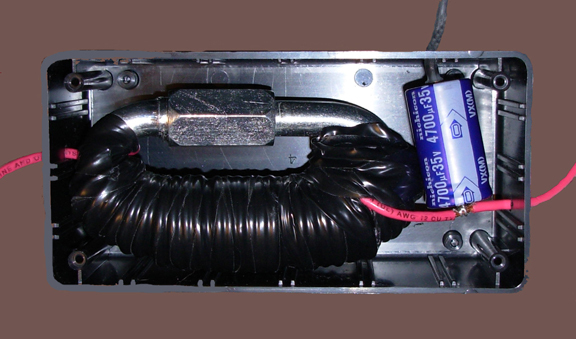 XCVR "Transceiver" (a unit integrating both a transmitter and a receiver). XIT "Transmit Incremental Tuning"; a common feature on HF radios that allows the user to slightly change the transmit frequency while leaving the receive frequency the same. Yagi An antenna consisting of two or more elements ("arms" that run perpendicular to a common boom) which are fed parasitically from one or more "driven" elements. The number of elements is proportionate to the gain (more elements means more gain). YL "Young Lady"; short for "girlfriend"
Zed A way of saying the letter "Z"; considered by many to be a more precise way of expressing that letter "Z"; prevents others from confusing "Z" with "E", "P", etc. Zulu Often used to refer to UTC (see above), as in "Zulu Time". eham.net offers much of the same services that QRZ.com does, such as a forum for discussing, on-line practice tests, radio mods, software downloads, etc. but they also have classified ads sections in addition. Once again, you have to register (free service) as a member of Eham.net , and then fill out your profile and jump on in. We do recommend spending some time reading other ham's postings before posting your own opinions or questions because you might find that someone has already answered that question for you. Got questions about a particular radio? Not a problem. Eham.net has a section that allows hams to post reviews of their favorite, or most hated as the case may be, radio to share their opinion with other readers. Got something to sell or want to buy? Eham.net had their classified ads out for longer then eBay, we think. And there is no charge for using that service because you are buying / selling direct with the other party. Be aware, there is not a third party guarantee like you find on eBay to protect you against being taken by an unscrupulous seller, but Eham.net will try to filter out those types of persons when reported. QSL.NET was started in the Winter of 1996 by K3TKJ as an experiment in managing a live Internet network and learning the Linux Operating System. The System has grown by word of mouth to be largest site devoted totally to Amateur Radio on the Internet. QSL.NET is a hobby site not a business, he do this because it allows him to give back to ham radio some of what it has given him. QSL.NET is dedicated to the sole purpose of furthering the abilities and interest of the Amateur Radio Community. If you are a licensed Amateur Radio Operator you are invited to reserve your free space on QSL.NET NOW. Sign Up and you will receive free E-Mail, with forwarding to your existing service, along with free server space to either move your homepage to this server, mirror your existing one, or lose all those excuses and finally START one. Now to the hard part, what do you have to do?? That is really the easy part, just move to the left side of the screen and "click" the part that says Sign Up for a FREE Homepage or E-mail Account! It is that easy, go ahead, do it NOW! Recently QSL.NET went over 800,000 users, it sends and receives over 2 million e-mails daily....and has online over 70,000 individual and club web pages. Not links...the pages live here. Now 10 years old, QSL.NET , QTH.NET and SWL.NET are the largest collection points of ham radio knowledge to be found anywhere. The QSL.NET system consists of 21 servers offering FREE services....all you need is to be a ham. 73, Al Waller, K3TKJ, QSL.NET , Inc. Thinking about QSL cards, and the high cost of sending SASE envelopes to request copies of the other ham's QSL? How about getting an electronic card that you can send / receive free of charge? Well, there is a fairly new web site out there call eQSL.cc which offers exactly that service. Free to sign up for basic service level, but you can pay $ to upgrade to higher levels of membership where you can have fancier QSL cards if you have an ego that needs polished. eQSL.cc is the first and only global electronic QSL card exchange for amateur radio operators and SWLs. It is designed to be the fastest, easiest, and cheapest way to exchange QSO confirmations, eliminating the cost and time that regular QSL cards have required for the past half century. The company is registered in the State of Texas and owned by David L. Morris, N5UP. Dave has over 25 years of experience architecting computer hardware and software systems and has been involved in other pioneering software projects involving amateur radio and artificial intelligence. He experimented and developed the eQSL.cc concept over a period of several years, designed the system, wrote all the software, developed the SQL database, designed the graphics, and currently handles much of the technical support. Claims to be the world's largest radio communications reference website, with complete conventional frequency assignments, trunked radio system information, frequencies, and talkgroups, FCC License assignments and maps, 10-Code Lists, agency maps, files, downloads, links, and detailed agency information for most public safety, military, and local government activities. All of this can be found in the Radio Reference Database. The Radio Reference Forums provide the largest most popular place to come and talk about radio communications monitoring. An independent source of Amateur Radio news from around the world available weekly in both text and MP3 formats. Many of the ham clubs around the world re-broadcast this recording during their weekly radio club net. Locally in San Antonio, the AARO Ham Club broadcasts this on their Monday night net at 8:30pm, prior to their check-in net at 9pm. You can click on either of the links below to download either a text or audio version of the news. This amateur radio web site explains how to use the AGWPE utility program to send and receive packet (a digital data mode) using the sound card of your PC instead of a traditional TNC (Terminal Node Controller), a radio modem. The site offers: instructions for configuring AGWPE, Windows, and some compatible packet programs advice about building or buying a sound card-to-radio interface troubleshooting advice. The key to sound card packet is a free program called AGWPE. AGWPE was written by George Rossopoulos, SV2AGW, and is an acronym for " SV2AGW's Packet Engine". It was originally created as a TNC management utility and has many super features of value to TNC users, however, this web site deals primarily with AGWPE's ability to encode and decode packet tones using your computer's sound card. AGWPE is the only program that can do this, other than MixW and Flexnet32. AGWPE is particularly valuable since it can act as a "host" program for several good packet programs that do not have sound card packet capabilities of their own. In June 2003, George SV2AGW released a new program, Packet Engine Pro, based on the original, freeware AGWPE program, but this version does cost $49. This module is also highly recommended to purchase if you plan on running the new Winlink2000 software in addition to Packet. Why use a sound card instead of a real TNC? First of all, it can be much cheaper. You only need a sound card interface, which is a set of cables to connect your sound card to your radio. Interfaces can be made for a few dollars or purchased for as little as $30-40 US, while the cheapest external TNC costs at least 100 US. And if you use the stereo qualities of the sound card to simulate two TNCs, so you could be saving the cost of two TNCs! Other good reasons are that an interface is lighter and less bulky than a TNC and an interface usually requires no external power; a TNC will need some power source. Another reason is that according to the program author, George SV2AGW, the AGWPE soundcard modem gives better results than a TNC . George says the 300 baud HF modem is so sensitive that it decodes packets you cannot hear; the 1200 baud modem can decode packets even with S3 or less signal strength; and the 9600 baud modem is better than the original G3RUH. To be fair, other users claim they get better results with a TNC; that TNCs are easier to setup; and that TNCs usually have built-in watch-dog timers to prevent continuous transmitting in the event of an error. Limitations: To be fair, other users claim they get better results with a TNC; that TNCs are easier to setup; and that TNCs usually have built-in watch-dog timers to prevent continuous transmitting in the event of an error. Note that most packet programs will not work with AGWPE. Only compatible programs that have been specifically written to take advantage of AGWPE's host services will work, but there are several good ones. Hardware Requirements: AGWPE will run in Windows 95, 98, ME, XP, 2000 and Vista. It will not run in plain old DOS or Windows 3.1. Some users have been able to run it on NT 4.0. The sound card features of AGWPE should work with most 16 or 32-bit sound cards (and integrated main board sound chips), although it will not run on all cards (see compatible sound cards). You should also have the most up-to-date drivers for your sound card. I recently installed a new transceiver in my truck. On the first day of using the new radio I got reports that I was transmitting very noticeable alternator whine. I could also hear it on receive and when the radio was quiet. I checked the diodes in the alternator, verified I had good grounds, and I even ran the truck with the alternator removed to be sure that the whine was indeed from the alternator. I tried an off the shelf filter from Advance Auto. It did very little so I decided to build a filter. The first filter I built worked VERY well. The problem is that not everyone has the tools required to build that filter so I decided to figure out a filter design that could be built in less than an hour by anyone with basic tools, have a cost under $20, and handle a current draw of at least 20 Amps. 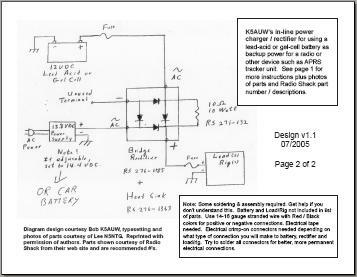 At one of the AARO club meetings, Bob K5AUW passed out a hand written diagram showing how to build your own charger circuit. This allows you to connect 12 volt power to this circuit, that will pass it along to your radio or other device, plus (and here's the trick) simultaneously charge the connected backup battery. If the external 12 volt power (DC) fails, the circuit allows the radio to draw power from the attached battery. The local ARES group recently asked all of their members to become "Anderson Powerpole Compliant" in their vehicles. This was so that they would be able to install and use city provided emergency radios if deployed with such, and to encourage the use of these more reliable connectors.